Oil States Packer Cups are designed to hold differential pressure in numerous downhole applications, such as zonal isolation, well testing, cementing, perforation cleaning, liner hangers and stimulation tools. Our packer cups are molded from a durable oil, gas and abrasion-resistant elastomer compound that withstands wear and tear, even under pressure. Oil States Packer Cups are available in NBR, HNBR, XNBR, Aflas, Viton and EPDM compounds. Standard-duty cups are stocked and high-pressure duty cups are available on request. 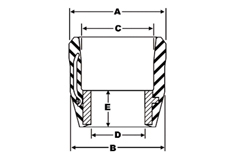 Sizes ranging from 2-3/8″ to 13-3/8″. Standard and high-pressure versions available. Special compounds available on request.